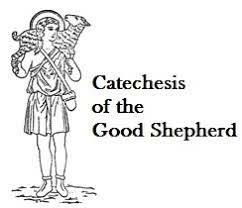 The Catechesis of the Good Shepherd is a faith formation program for children, grounded in Scripture and Liturgy, based on a Montessori type method. The children are guided with presentations and provided hands-on materials to fully explore and investigate Catholic Tradition and themes. The children, ages 3-5, will meet in their own classroom called the "Atrium" - The Atrium of the Good Shepherd. This parish children's program is co-sponsored by St. Peter's Religious Education and the Dominican Laity. For more information call: Chris Langley, DRE 870-425-2832 ext. 3; Tina Johnson, OP 870-425-2832 ext. 2; or Eileen Olwell, OP 870-425-8525. Click here for "This Week in the Atrium". When we come to visit Jesus in this Atrium, we work quietly, and we listen, so that we can hear the Good Shepherd's voice in our hearts. We give him our love, and we are kind to one another. As we work silently and think about the mysteries of Jesus' life, He teaches us without words in the stillness of this room. Please bless our time together, Jesus.